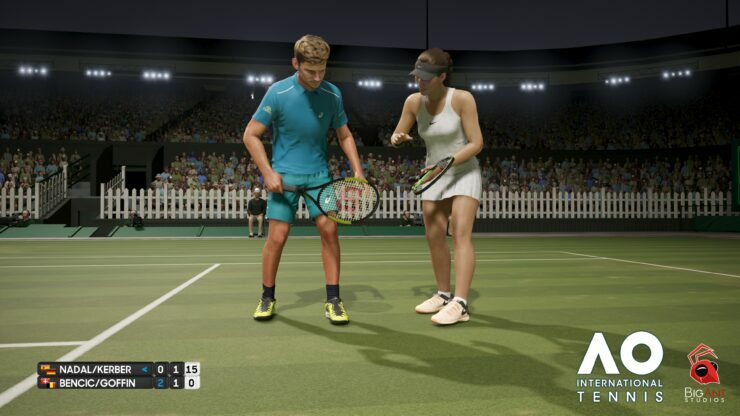 AO International Tennis from Big Ant Studios (Ashes Cricket) will be the first in a trio of tennis titles due to be available globally by June, the other two being Tennis World Tour and Mario Tennis Aces. The game actually launched as AO Tennis during the Australian Open, but only in the Land Down Under. Now, though, it’s about to be available everywhere else on May 8th for PC, PlayStation 4 and Xbox One. We’ve interviewed Big Ant CEO Ross Symons on the enhancements made to this international release as well as some of the unique features of the game, chiefly the ability to create new players with your own face as well as creating new stadiums and decals. AO Tennis received mixed reviews when it launched earlier this year on the Australian market. What kind of tweaks and changes did you introduce for the international debut? International Tennis, they’ll see two very different experiences. The advantage of launching AO Tennis during the Australian Open was that we were able to hear all the feedback from the fans and then really take it to heart in order to produce the tennis game that everyone wants, so moving from that game to AO International Tennis has been a great journey. While you have a considerable experience making sports games, this seems to be your first tennis game so far. What kind of research did you make beforehand and how long was the game in development? competitive players when they were younger. There is a genuine passion for AO International Tennis within Big Ant, and tennis itself, a lot of our understanding of the sport comes from being students of it ourselves. who understands tennis better than the actual governing body behind it? Tennis Australia’s support for this game has been unparalleled, and it has really helped us with making sure our game stays true to the sport. Does AO International Tennis gravitate more towards a simulation (e.g. Top Spin) or an arcade (e.g. Virtua Tennis) kind of game in your opinion? Also, is there any unique gameplay feature you were able to add? back on the PlayStation 2 and Xbox or early years of the PlayStation 3 and Xbox 360. That being said, we are big fans of Top Spin, and love the idea of a serious simulation of the sport, as opposed to the more fast, fluid, arcade-like tennis games that tend to dominate. AO International Tennis is definitely a simulation and we wanted to create an authentic and realistic take on the sport. Can you disclose how many licensed players and stadia will be available in the final game? Do you plan to add more through DLC? game’s effectively limitless in how many players and stadia will be available to tennis fans. What is the extent of the online modes available in AO International Tennis? Will it be possible to bring the player character you created to play online? Are there rankings for singles and doubles? What about tournaments? We have noticed that AO International Tennis is listed on Microsoft’s official Xbox One X enhanced page. Can you disclose the technical specs of the game on Xbox One X? resolution at a constant 60fps. The game is also coming out on PlayStation 4, so we are wondering whether there will be PlayStation 4 Pro enhancements as well and if so, how they compare with the Xbox One X. The PlayStation 4 Pro runs AO International Tennis at 1080p resolution with a constant 60fps along with increased texture resolution. Is there a chance you might bring the game, or any of your other games in the future, to the Nintendo Switch console given its success? release AO International Tennis on the platform but it is being looked at. With regards to AO International Tennis, would you like to make it into a franchise if successful and iterate on it with future installments? over a number of years. Each sport has its own quirks and development challenges, and each sports community wants different things from games that depict their favorite sports. With that in mind, we develop unique engines and technology for each sporting game that we create, and it would be a little bit pointless to go to all that effort for a one-off. Of course, whether we create further tennis games depends on factors such as commercial demand, but we’ve certainly gone into the development of this with every intention of making a long-term commitment to the sport.